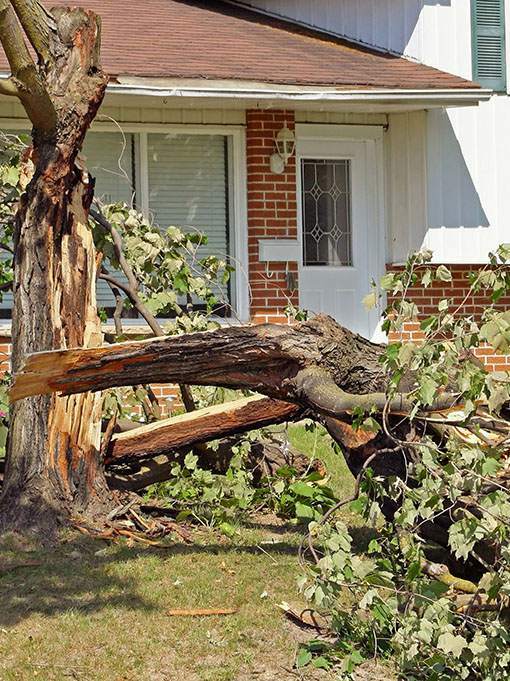 It doesn’t matter what kind of tree you have, there are potential dangers to be found in any. These can not only place homes at risk if they are situated in close vicinity, but they can also put family members in danger, and more so with children because they are naturally attracted to trees. It is better to be safe than sorry, so calling Las Vegas Tree Removal Pros can put your mind at ease if you see any of the following elements which might become a hazard. These are the most visible of all tree hazards and are signs there might be something wrong with your tree. To understand how severe the risk is, it would take a professional to take a look and to assess the danger. Las Vegas Tree Removal Pros first use binoculars to check for other signs of weakness before further investigation. This can be a follow on from the previous hazard, and might not be initially visible. Dead limbs can hang and then fall if there are strong winds or movement in your tree. These can remain in your tree for years going unnoticed and then fall when least expected. This happens when the bark is ingrown and usually develops when two or more trunks grow close together. You can get a V formation, and these can be more likely to split the bigger your tree becomes. Professional tree surgeons can advise and more often than not they would suggest trimming the tree if possible. These can happen due to winds or other natural occurrences. But in most cases, there is a need for professionals to take a look and determine if the problem is worsening. Las Vegas Tree Removal Pros will also check in which way the tree is leaning. If it is toward your property, this is a no-brainer and the tree needs removing. If it is leaning away, the root structure needs to be examined because this could damage the foundations of your home. This is also a follow on from the previous tree hazard to look out for, and can have just as severe consequences. Damaged roots can affect the growth of trees, and the problems don’t show until many years later. Signs of this are wilting, thinning foliage and undersized leaves along with other aspects that professionals are trained to notice. Some individuals attempt to rectify problems themselves. However this can pose more danger than the issue itself. If you have any concerns with any of the above, or there is something else which doesn’t look right. Las Vegas Tree Removal Pros are more than happy to give all your trees the once over.